Vehicle mods like this isn’t about to stop anytime soon. Too many people enjoy and are willing to pay top dollar for over-sized wheels, funky body kits, and 84 speakers embedded into the dashboard alone. So we’re going to have to live with it. The latest thing for Chevrolet Camaro purists to hate over is this thing. The DiFalco grille by Forgiato. 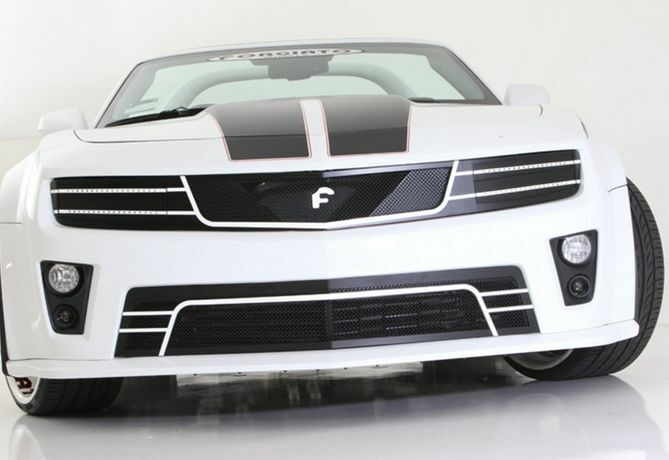 The company says that the $3,999 front fascia will fit on the LS, SS and even the ZL1. Yes, it costs $3,999. Why so much, you ask? Theatrics, of course. The grille covers the headlights with a black-and-white panel with horizontal LED accent lighting, which open like eyelids and reveals the standard Camaro headlights and turn signals whenever the driver switches the lights on. Should be fun whenever the driver signals to turn, we think. So, is it hot, or not? For those that love it, may also love the King Camaro by 813 Customs. Definitely NOT HOT. The standard headlights are one of the key things that give the car its distinctive character. This detracts from that. Makes the car look almost sleepy, as if it is trying to nod off. I like it .. Very Clean look .. Like the old Hidden High lights on the RS Camaro in the 60’s (:>) GM should offer it as a High End Option !! he is verry nice and well maneged in ltue and withe he is better. It is hard to fathom what some find appealing. I’m a definite no on this. Send it back to wherever it came from! For me is the best. Black all the lines out and put it on a black car and get rid of the big F ,maybe. not a fan…of the execution. but i love the idea. it does make one wonder; with GM chasing the retro trend with the 5th gen Camaro in the first place, why didn’t they do an in-house RS hide-away grill? i can’t shake the feeling that if Ford had such a feature in it’s past with the Mustang they would have been all over it from day one. just like the they were with all the special edition variants and stripe options, and of course the sequential tail lights! never mind that that was actually a Cougar thing. It’s a perfect car, when you can’t see than it is better to go sleep a few days. Had this been better executed, it could have been hot. The concept, HOT. The outcome, NOT. it is very very nice and very good For what reason even ones.He it a Highlight.